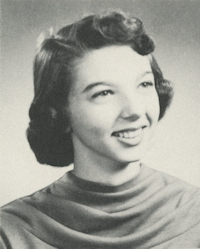 Obituary – Schwandt, Linda Lee (Martin) « Perry High School Alumni Association, Inc.
﻿All School Revue 54-55, Red Hots 54-57, Red Hot Drill Leader 56-57, Library Staff 54-57. Linda (Martin) Schwandt was born on July 14, 1939, in Bristow, Oklahoma to Glen and Theda (Nall) Martin. She went to be with her Lord and Savior on Friday, June 2, 2017 at Green Valley Nursing Home in Perry, Oklahoma. Linda moved to Perry with her parents when her father purchased the Corner Lunch Café. 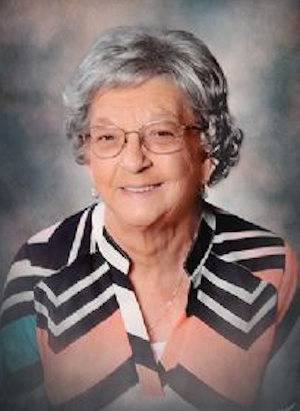 She attended Perry schools and graduated from Perry High School in 1957. It was at this time that she met the man that would become the love of her life, Darrel Schwandt. They married on October 10, 1958, at the Christian Church in Perry. Daughter Kelli Lee was born in 1959 and son Timothy Martin was born in 1964. Linda served as a Blue Bird, Cub Scout, and Camp Fire leader, FFA Mother, Band Booster, Takedown Club mom, and FHA mom. She was extremely proud of her children’s accomplishments. She worked alongside her husband, serving as his secretary, and later, taking over the Shelter Insurance Agency upon Darrel’s untimely death in 1986. During their marriage, they were able to do some traveling. Some of their favorite trips were to Boston, Hawaii, and Spain. Many family vacations were spent in Branson, which remains to be a favorite of their children and grandchildren. Linda also had a ceramic shop, The Gingerbread House, for several years. The business was a gift to her from Darrel. Linda was a proud and active member of the First Baptist Church in Perry, helping with the card ministry, women’s ministry, Wednesday night dinners and vacation bible school. She was a friend to many, but her most treasured times were spent with her family. Linda is survived by her daughter, Kelli Kindschi and husband Randy, of Orlando, OK, son, Timothy Schwandt and wife Dawna, of Perry; five grandchildren, Jordan Kindschi and wife Amanda, of Stillwater, Adam Schwandt and wife Megan, of Perry, Karly Kindschi and fiancé Justun Kukuk, of Perry, Nathan Schwandt and wife Paige, of Perry, and Hanneah Schwandt, of Perry. Also, 4 great-grandchildren; Londen Schwandt, Blakely Schwandt, Kenzley Schwandt, and Addilynn Schwandt. Services will be held Tuesday, June 6, 2017 in the First Baptist Church of Perry, Oklahoma, with Reverend Kim Hays officiating. Interment will follow at Grace Hill Cemetery in Perry. The family will receive friends on Monday, June 5, from 6:00pm to 8:00pm at Brown-Dugger Funeral Home in Perry. Arrangements have been entrusted to the Brown-Dugger Funeral Home.